Another way to save money with baby is baby led weaning. 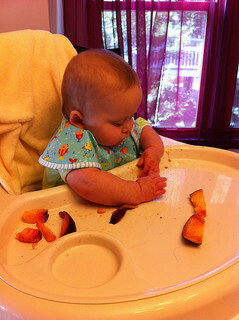 Baby led weaning is much more common outside of the US, but it’s got a growing group of proponents in the US as well. We couldn’t do a “pure” baby led weaning approach because it made daycare (and grandma) nervous, and so we had to make some purees to send to daycare with her. But, we never bought a jar of “baby food” or a box of rice cereal, so Daughter Person’s solid foods were just part of our normal grocery budget. We’d just give her some of whatever we were eating. 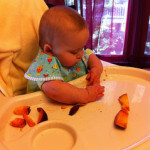 Our purchase of fruits increased when we started feeding her solids, but that was about it. Baby Led Weaning (or BLW) is when you go straight from breastfeeding or formula to “adult” solid food, skipping the rice cereal and purees that are baby’s most common first foods. You feed your baby regular food that you’d eat yourself. There are some differences though – for example, you wouldn’t give a baby meat until they’ve got some teeth to be able to chew it, and you tend to need to overcook veggies so they’re soft enough. You can find more information about BLW and some recipe ideas online. Daughter Person turned 6 months old in July, so we had it pretty easy: we started with peaches – plentiful, in season, and most importantly soft. We sliced peaches up into thin strips, and initially removed the skin from the slices, but we learned very quickly that the skins helped her hold onto the peach slices as she was eating them. We moved onto pasta, steamed carrots, green beans, avocados, kiwi, mangoes, lentils and beans. Daughter Person didn’t get any teeth until she was almost 10 months old, so we were semi-limited in what we could give her up until then. Anything we thought she could gum was fair game (Cheerios are very gum-able by the way). Once she had her teeth, we started giving her more variety: chicken, beef, pork, slightly less cooked veggies. She learned to use a spoon and fork pretty early because we gave her the opportunity. By the time she had teeth, we were just giving her tastes of what was on our plates – spices and all. Yes, it makes a mess for a while – although I’ve seen pictures from parents who went the puree route and it’s about the same amount of mess sometimes! Daycare and grandma had concerns about her choking. When they first start eating, they have trouble keeping the food to the front of their mouths, so they look like they’re choking when they’re gagging. You really do have to learn the difference between choking and just gagging. They do eventually get the hang of it and stop giving you heart attacks every time they eat. We pureed some food for her, and sent that in with her to daycare – she really didn’t like it. One thing our daycare did let us do was highlight on the school menu what she was and was not allowed to have, so we highlighted everything we thought she could handle at the time – and I think she was the only baby in the infant room on the full daycare menu (most others switched in the toddler room 12mth+). There are some precautions to take while using the baby led weaning approach. If you or other family members have an allergy, hold off on those particular foods until you’ve gotten the OK from your pediatrician. Only introduce 1-2 new foods at a time so you can catch any allergic reactions (just like with purees). Don’t feed them choking hazards (grapes, nuts, hot dogs, popcorn, etc – your pediatrician should have a full list). Finally, be comfortable with the equivalent of the Heimlich maneuver for babies/young children. We never had to use it, but it never hurts to be prepared. We now have a toddler that will eat many things most “kids” won’t eat: stir fry, salads, and lots of fruits and veggies. We still don’t give her the choking hazards, except grapes, but otherwise, she eats exactly what we eat for breakfast, lunch and dinner. Sometimes she doesn’t want to eat that particular meal that particular night, but that’s a different story. This entry was posted in Finances, Parenting and tagged baby led weaning, saving money with baby on August 16, 2013 by Mom. We went straight to soft food too. Our guy only had 2 jars of baby food that we got for free from somewhere and that was it. He’d rather eat soft food. I think he was a bit older though – maybe 8 months or so? I don’t remember exactly. I do a lot of BLW, well did, she’s 14 months now. I breastfed until 12.5 mos so I wasn’t concerned about nutrition. Infants have a very interesting gag reflex. It’s deliberately sensitive so they can’t choke as easily as an adult. They start gagging much sooner than an adult would since the hard palate isn’t fused (roof of mouth) totally until much later in age. The gagging freaked out grandma and the daycare ladies. I have to admit that it freaked me out the first few times too, until I was comfortable looking at her and figuring out that she was “just” gagging and not choking.